The University of Warwick website can be accessible for everyone if we consider how people access the differently when we create web content. Last autumn a new EU directive came into existence that requires public sector websites and applications to be accessible by meeting the AA level of conformance of the Web Content Accessibility Guidelines (WCAG) 2.1. The new legislation sets deadlines between September 2019 and September 2020 when public facing websites need to be accessible by. In the UK, one in five people has a disability. While not all disabilities affect access to the web, many do. As we age many of us find it harder to read small print or we see colour in a different way, making the web site better for those with disabilities helps everyone. We know that our students use Dragon or Jaws speech readers, and ZoomText to increase text size. They can do so in the accessible study rooms provided, supported by Library staff, or on their personal computers. Some people may navigate a website with the keyboard only, or even use a combination of techniques to get around the web. We have a community of people who need to use specialist software to access the web (assistive technology) and others who make minor adjustments so they can use the web more easily. I create web pages, what do I need to do? If you are an occasional web editor, who tends to edit text based web pages, you should follow the advice below. This checklist gives advice on the main accessibility issues you should address and gives details of some free checking tools and techniques you can use. There are checks that need you to review the content you've created by eye, for example to to avoid complexity, text in images or to make sure the layout is uncluttered but luckily this doesnt require deep technical knowledge. Please feel free to seek help if you are not sure what you have to do. 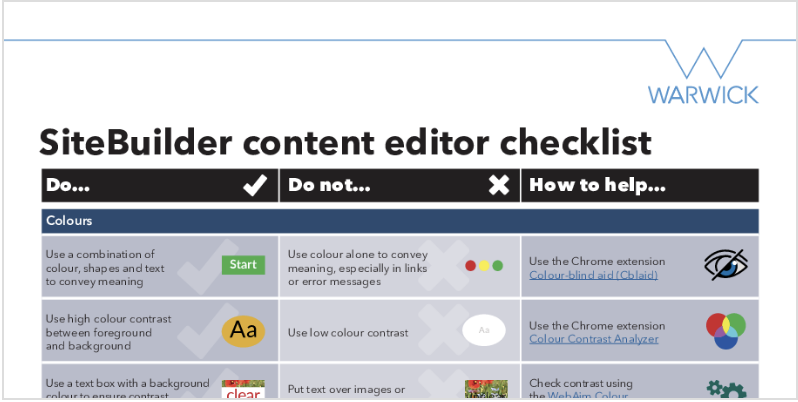 We hope to make further changes to content editing in the future, to help check for accessibility when you are creating and editing web pages. If the majority of your job is related to web work, if you don't already then you will need to get a fairly good understanding of the principles of accessibility and the web standard that is WCAG 2.1. We suggest you follow the steps below. Inspect your public web pages to ensure these rules have been followed and adjust to suit. Tackle more popular pages first. There are lots of training materials available. This video on accessibility examines different personas, gives a good coverage of what to do, you will need to get a subscription, though. Public pages must meet the AA WCAG 2.1 standard. Get familiar with what you need to do. Start updating your pages following the guidance here.